Today, Playing Out reaches Brighton for the first time. Playing Out is a small, grassroots community movement started in Bristol, aimed at activating street play in your neighbourhoood. The theory is that modern-day kids don’t do what a lot of us used to when we were younger – that is play outside after school. The reasons for this are varied and include busier roads, more protective parents, more ‘enticing’ entertainment indoors. Two mums in Bristol organised the first Playing Out session back in 2009 and it’s slowly branching out across the country. 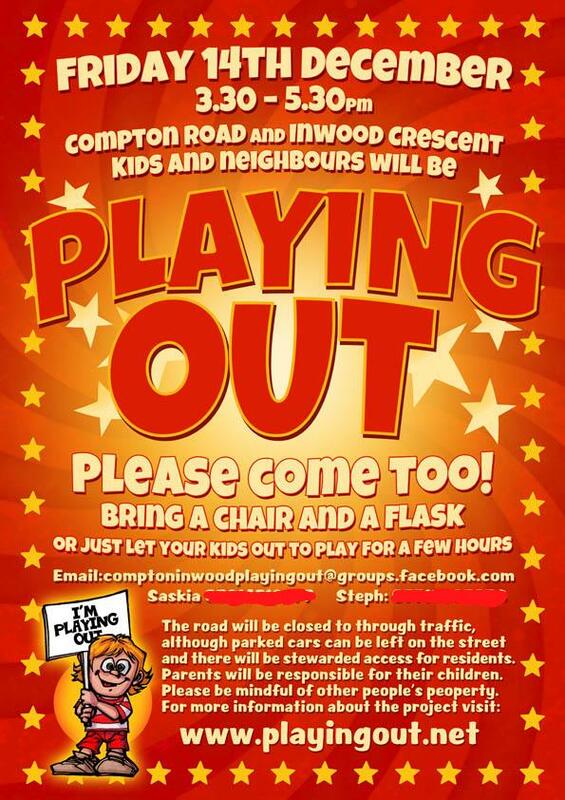 Today (Friday 14th December), the first Playing Out session hits Brighton – in Compton Road and Inwood Crescent. It’s taken about 2 months from the first ‘street’ meeting to today’s event. Now we’re ready to don high-vis jackets and brave the winter weather to supervise and marshal. Typically, the Great British weather is looking like it will make the first one a little soggy, but we’re confident that this will become a regular event throughout the year. I am in the process of setting up a one-off playing out session off Lewes Road, with a couple of other parents. We thought this was the first Brighton event. How exciting, you’ve done it! Please let me know how it went. We are canvassing Whippingham St this weekend and are taking it from there. Aiming at Sunday before Easter. Best regards, Heike. Really and truly, doing it just before Christmas wasn’t the best time, but it was a start. Monitoring traffic is the biggest thing because even residents were keen to zoom off, regardless of being told children were playing in the street. Also think parents need persuading that their kids will be OK running off out of sight (depending on their age). I reckon Easter’s a good time to do it – we did it after school on a Friday and may rethink that next time. thank you for quick reply! We have a facebook page now- is it possible to link to yours if you have one? Also I did not mean to put my phone number up there- if you don’t mind please delete. Thank you! Heike again. How did your de-brief go? We are finishing our canvassing this week, then tackling the application to the council. Would love to pick your brain. Btw. your poster design is fab- who did that? This sounds brilliant Rob, hope the sessions are going well. Heike – are you still doing Playing Out sessions? We’re just off Lewes Road too… Be great to get in touch! You can reach me through my website: http://motherslove.co.uk (not sure I can post phone number on here). Yes, we’ve run throughout the summer, once a month on a Friday, from 4-6pm. In fact, we did one last week. We’re thinking about keeping them going throughout the winter – weather permitting! Raymond Rapson on Will Gary Glitter ever get radio airplay again?